It seems lately that every day another minister for the DWP has something disastrous to say about claimants. The whole scroungers rhetoric took on a new slant in the beginning months of this year with statistics like, 71% of DLA recipients on life time awards left to languish un checked and 8,000 move in to work because of the benefit cap. These sorts of figures, of which there are numerous, are hard enough to swallow at the best of times, and these are far from the best of times. For disability campaigners it is hard to almost daily, see stats we know cannot be true, banded about like the crock of gold at the end of the welfare reform rainbow. This is how our campaign started really, we were both on Facebook both bemoaning yet another press release from Esther McVey that announced another appalling stat that both Jayne and I knew to be nonsense; I said “someone should right an open letter to that woman”, Jayne replied “are you up for it” and I think my reply was, “what me!’” and it went from there. We drafted an Open Letter to Esther McVey the Minister for Disabled People and put it up on line asking people to sign it; over the space of a month or so, 866 people signed the letter and left comments, some angry, some supportive of what we where trying to do, and some harrowing stories of Work Capability Assessments and hardship brought about by the so called reforms. Whilst we were promoting the open letter and collecting signatures Jayne approached change.org about setting up a petition. It had been decided early on to send a copy of the open letter to the Work and Pensions Select Committee, including any comments along with the list of signatories, asking them to investigate the misuse of statistics by the DWP. We sent a copy of the letter and signatures to Dame Anne Begg the chair of the select committee, and continued to update her as the open letter grew. So it made sense to address the petition to the same Work and Pensions Select Committee, given their particular interest in the open letter and pages of comments. They W&PSC are responsible for monitoring how changes in policy and laws, effect people on the ground and can investigate when things go astray; they can also investigate MPs behaviour. We launched our petition and waited to see what would happen, not really expecting very much and we were pleasantly surprised when it started to climb quite quickly. In the mean time we had closed the open letter and sent both a hard copy (by special delivery) and an email copy to Esther McVey, and several other politicians. We had discovered after launching our letter that many other people were trying to get some action to stop the DWP ministers misusing stats; from other disability groups, through to MPs and even members of the select committee, so it seemed our letter and petition were timely. We sat back and waited for a reply from Esther McVey…….. None came….. But…. The petition with change.org had succeeded spectacularly; currently standing at 100,593, it has also been mentioned in several national newspapers including the Guardian and the Newstatesman. After a month or so we decided we needed to nudge the DWP regarding a response to the open letter, and so we wrote a second letter asking for such a reply; this was both emailed and hand delivered to Esther McVey’s office by a fellow campaigner. This time we didn’t wait and we drafted a template letter for supporters to send to their MPs asking them to find out why the open letter had been ignored. This got us an official reply very quickly, but it didn’t answer any of our original points and was very dismissive; we forwarded this to Ann Begg who did not seem amused, nor were we. So this is where we are now; we have in the pipeline another letter to Esther McVey demanding a proper and considered reply from her and not a sectary, and we have October to look forward to. We also hope to be handing our petition in to Liz Kendel MP outside the Houses of Parliament, where she will then submit it to the floor of the House of Commons. We are trying to arrange this as close to the date we get from the W&PSC, for the meeting with Iain Duncan Smith, as possible; adding the voice of over a hundred thousand people to those MPs and campaign groups that have also called for the committee to investigate. In the mean time we intend to keep collecting signatures and evidence of the misuses of stats by MPs and Ministers and continue to try to get a reply from the disabilities minister. Jayne and I had met some time before all this, on facebook and twitter and we are mutual members of many FB disability campaign groups; we have both in the last few years become increasingly involved in various campaigns and campaign groups. Jayne describes herself as a fifty(ish), disabled woman (including Fibro) who worked full time for over thirty years as a community activist, adult tutor & counsellor whilst also raising her, now adult children; until her health degenerated to a point her GP compelled her to leave employment 4 years ago. Since then she’s been fighting the system to claim contribution based ESA & DLA she’s had 4 ATOS assessments and has been through 3 reconsiderations, where she had to persuade DWP decision makers, that her Dr & consultants are actually correct and 2 tribunals (both successful). The trauma of these experiences alongside battling with officers at her Local Authority for Housing/Council Tax benefit on each occasion has made her very cynical about the rationale behind all of the ‘Welfare Reform’ cuts. She is also a carer for her partner who also has a chronic long-term condition. As for myself I am a 48 yr old mum with Fibromyalgia diagnosed 17 yrs ago, I have a six yr old with SPD, and I’m a carer for my partner who has bone cancer and MSSA bone infection. I get DLA and I have a job. I’m a community education art lecturer, I work with people with mental health problems, and I also have my own business that I’m struggling to keep a float with no help, because I don’t meet the DWP’s minimum income floor for the work programme. I got involved with the We are Spartacus Network a couple of months after I had my own ESA assessment; which was a month before I was due to go self employed (what a waste of money that was), I was found ‘Fit for Work” no big surprise, even considering I am still ill. I am also a co founder of Disability Matters UK a disabled person led disability organisation. I have watched my students and sick and disabled friends fall foul of the ESA process; people who ARE genuinely sick and disabled being left with next to nothing to live on and living in fear of the PIP assessments to come. And I have watched these same people as they bang their heads against a wall this government has created, a wall fashioned out of spin and misinformation to discredit all claimants of DLA, so they appear to be fakers, even though the fraud rate of DLA is a tiny 0.5%. The reality of these people’s lives is so much worse than most can imagine. Iain Duncan Smith in his capacity as Minister for the DWP and the 4 junior ministers under his authority since the coalition was formed, have all persistently misused statistics and rhetoric to justify the changes to Social Security. It is important ministers take responsibility not only themselves but also for their ministerial team’s actions and this is why we wrote the Open Letter to Esther MCVey and started the Petition to ask the Work and Pensions Select committee to investigate. Thanks for spending time and spoons to read this I know its long Phew! Further to our story yesterday entitled “Benefits Paperwork Overloading Claimants” this website has uncovered certain documents in the public domain that seem to demonstrate confusing and conflicting information from the Department of Work & Pensions (DWP) with regard to Employment & Support Allowance Appeals. The story yesterday spoke of ESA Benefit claimants being swamped by the paperwork that is involved with making a claim. 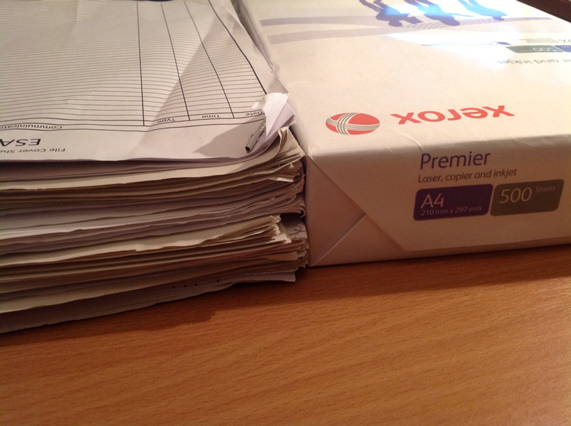 The picture above was used to demonstrate the size of one claimants file of paperwork about her ESA claim that started in July 2010 which is still ongoing, next to a standard pack of 500 sheets of A4 paper to show comparative size. This claimant has not been paid any benefit money for approximately one year but is swamped with the paperwork involved in appeals and Tribunals as she believes she has never been placed in the correct category for her limited capabilities due to her Fibromyalgia. The story also referred to a BBC Website article on the 4th May this year entitled “GPs ‘flooded’ with letter requests due to UK benefit reforms.” This article claimed BMA Scotland had said GPs were being “flooded with additional avoidable work” as patients seek support regarding benefit payment appeals. Dr Alan McDevitt, chairman of the BMA’s Scottish General Practitioners Committee, said: “The UK government’s flawed approach to benefits reform and changes to the Work Capability Assessment are flooding GP practices across Scotland with additional avoidable work.” It also states that The committee has advised GPs not to respond to these sort of requests which could literally leave claimants high and dry as they can not collect medical evidence to appeal. There seems to be total confusion about who should be requesting medical evidence from GP’s and Health Professionals. Quite simply it appears claimants are given misleading information from the DWP and do not know if it is their responsibility to collect medical evidence for an appeal or if that responsibility lies with the DWP. Due to this patients contesting controversial Work Capability Assessments conducted by ATOS Healthcare are having to collect evidence against these assessments for their appeal cases and they are doing so in huge numbers which is putting a strain on GP’s. There is so much strain that the BMA in Scotland are advising GP’s not to respond to requests which could lead claimants without benefit they may be entitled to because of the sweeping benefits reform especially with regards to ESA. In yesterdays article we showed how claimants are swamped with benefits paperwork, the BBC article claims GP’s are swamped with benefits paperwork and we also know the Tribunals Service have a huge backlog of cases and are swamped with benefit paperwork as well. Therefore it is no surprise that a number of disability charities teamed up with Citizens Advice (who are incidentally swamped with benefits paperwork) to publish a document in 2010 about ESA, entitled “Not Working” because the benefits system is literally “Not Working” and since then nothing much has changed. This government have said they are committed to reducing bureaucracy and cutting paperwork levels within the public sector. But with regards to benefit reform and ESA, everyone concerned seems to be swamped in benefits paperwork as this system is simply “Not Working”. Someone cleared a paper jam at the DWP! I have had one of those collections of letters you can only get from DWP (Jobcentre Plus.) You know the type, it’s as if someone has cleared a printer jam and they have sent you all the rubbish the system sent to print! It is so silly when you get multiple letters at the same, often containing contradictory information. Anyway, reading between the lines it looks like they are backdating my Support Group ESA payments after all. You get a four page letter each time a payment setting is changed. “From [Random Date] your payments will change to [Random Value] a week, if you disagree then you can appeal etc…….” it always seems that these dates are plucked out of the air and it’s almost impossible to work out if your getting the correct amounts. When you put all the letters together you have multiple dates, some only a day or so apart, the only true approach you can take is to total what you think you should be paid over a certain period, total what you have been paid and if there within a hundred quid of each other then accept it, if not, (deep breath) complain! Whoever thinks this process is fit for purpose needs a health check. Wouldn’t it be nice to have it layed out bank statement style in over a page so you can see exactly what’s going on! People say fuel bills are confusing……. I will share a little story with you, my mum received a pile of these letters for her ESA, basically they all said from [Random Date] your payments will be £0.00, if you disagree……. Blah, blah blah! I will cut to the chase……. I’m in the Support Group for Employment & Support Allowance!!! It’s taken a matter of days short of Three Years to get it though! That’s right, three years of hellish backwards and forwards communication, involvement of MP’s threats of legal action, national and local media involvement, and even threats to publish my entire case file online have paid off! The truth is, since I left employment as a Police Constable I have been unfit for work and work related activity and as such I contacted the benefits hotline all those years ago and was advised that Job Seekers Allowance was the correct benefit from an adviser who hadn’t even heard of Employment & Support Allowance! This set the tone and was the standard of service I have received from “Jobcentre Plus” and the DWP at almost every turn. Looking at my file its sheer thickness is about the same as a pack of 500 sheets of A4 paper and my success is down to my painfull journey to learn about the law so I know what should happen, better than most of their paid “advisers” and hold the DWP to account at every turn. One major objective for this site is to educate and inform, so that suffers of Fibromyalgia don’t have to do what I have done and can benefit from the lessons I’ve learnt, as its almost impossible to get the correct benefit unless you learn everything about the system and the law behind it. This is because the system does not work, the staff are incorrectly trained and the computer system that manages all claimants is unfit for purpose! Obviously for me it’s not all good news, for some reason I can not fathom just yet I won’t be in the Support Group until the 28th August. I don’t yet know why I can’t be in the Support Group from now or even from the date of appeal. I also don’t know why my benefit isn’t being backdated, my latest appeal started last year and all my ESA was cut back in April/May time. Another thing I don’t know is how long I have been awarded it for, from experience I know it can be for as little as three months at which point I will have to start again with an ESA50 form and another probable ATOS medical. It is a joke that classification can take longer than the award is for and the appeal process can take over a year for an award of three months! So chances are a claimant will either be in the assessment phase or an appeal phase rather than being in an confirmed awarded phase! It’s o wonder the DWP have completely overloaded themselves with assessments and appeals is it? I will now have to fight for my award to be backdated so the fight is far from over! I also want to write a comprehensive guide in PDF form on benefits like ESA & DLA. This will include advice on how to prepare for an ATOS medical, how to write a successful appeal and how to prepare for a tribunal. The truth is that this is going to take quite some time, my health means most of my time is spent in bed and incapable of working on such a document as frustrating as it is. In the meantime a lot of the advice I would write in a guide can be found on the benefits sections of this website. I can not stress enough how important it is to do your own points assessment using the links I have provided before you fill in an ESA50, attend a medical, file an appeal or attend a Tribunal. Also remember its all about evidence, your word is not taken at face value so get statements from medical professionals and inform all consultants etc you require a copy of all reports to your GP as trying to get them all copied afterwards takes time and probably money! Of course, I will keep you updated with how I get on! Use the site and get in touch if you have any questions! After my frustrating post on June 15th I wrote another letter of complaint to the DWP (Jobcentre Plus) I told them the situation literally meant this letter was a complaint about a letter of complaint that was not acknowledged about a complainant and appeal that was acknowledged. Thats how absurd the situation was. I said I would have to consider writing to my MP to start another investigation, the Highest person in the DWP, publish my entire case file online (circa 400 pages) and write to local and national media! Isn’t it stupid when you have to go to these lengths? Well I finally heard from them, (first time since November when they told me they were dealing with it only to have my ESA cut in may) by means of a phone call. Hurray, someone is going to communicate! He was very polite and assuring and explained there had been a catalogue of errors by Job Centre Plus and ATOS healthcare with respect to my case. Basically a decision was made in December but I wasn’t informed. Then no one acted upon my first letter which to be honest I’m not sure it’s even made it to my file, then my complaint and appeal was not auctioned because I hadn’t signed the letter personally (due to my illness that day I asked my other half to print and send it) and that no-one had taken it upon themselves to tell me anything until three complaint/Appeal Letters were received! So, he took my verbal evidence as reason for “late appeal” so he could actually submit it and sent me copies of all paperwork for signing. I took the opportunity to send a batch of medical reports through as well. It was a pleasant conversation and I think we both understood each other but I suppose only time will tell! Some of the letters have already been sent…. The changes have put a cap on claiming Contribution Based Employment & Support Allowance if your in the Work Related Activity Group and state you can only get it for 365 days. Those who are entitled to Income Based ESA or those in the Support Group should not be effected and those entitled to income based ESA should be automatically moved to it. As you can imagine there is a lot more information on the subject here so I would suggest that anyone getting Contribution Based ESA and are in the Work Related Activity Group should visit this site and read about the changes and how it effects them.